From the kitchen to the bathroom, anywhere you need a step up the StepSafe steps in, then folds away in a flash when its job is done. The handy helper for children and adults to reach high shelves and fixtures, or get easily into tall beds and vehicles, you'll wonder how you ever did without it! For ease of use, the StepSafe Folding Step Stool ranks #1. To unfold it, simply tilt it and the leg hinges automatically swing open and snap into place. To fold, just pull up on the handles. For EZcarrying, the built in handles can't be beat. It lets even little kids carry with ease. Don't have extra room? No worries! The Stepsafe can be stored practically anywhere. Folded, it's less than 2" wide, perfect for fitting into the tiny space between a wall and a piece of furniture or kitchen appliance, or riding in the trunk of your car. Minimizing the risk of slips and falls, the StepSafe platform is covered with large, non skid rubber dots which are specifically designed to give you the strong grip that you need in order to keep your balance steady and prevent slipping. 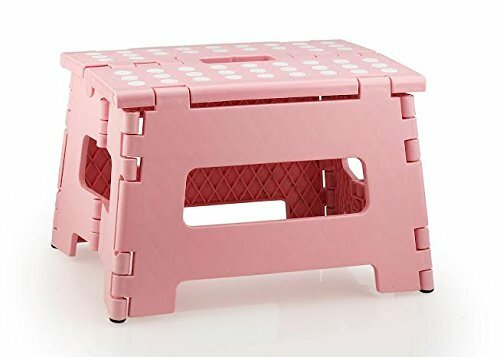 This heavy-duty plastic step stool can handle up to 300 lbs. without wobbling, yet it's lightweight enough to easily pick up and carry to wherever you need it. Click the "Add to Cart" button at the top of this page to purchase your StepSafe stepstool now! EZ Carrying - Durable carrying handle allows you to carry the step stool wherever you go. Safety Feature- Non Skid rubber dots on the step stool's surface designed to give you a strong grip and prevent slipping. If you have any questions about this product by StepSafe, contact us by completing and submitting the form below. If you are looking for a specif part number, please include it with your message.